From the ancient temples of Angkor to the floating villages of the great Tonle Sap Lake, you will learn about threats to biodiversity, environmental governance, and the ways in which conservation efforts and community livelihoods are intertwined. Traveling extensively, you will spend time in the elephant-inhabited forests of Mondulkiri, the mountain and coastal ecosystems of Kampot, the Mekong Delta, and at key sites along the Mekong River. Spend your summer in the lush Keo Seima Wildlife Sanctuary, studying the behavior and ecology of the endangered Asian elephant. Examine human-wildlife conflict and conservation pressures, and discuss elephant welfare and management practices. Visit the vibrant city of Phnom Penh and the ancient temples of Angkor to explore the history and culture of Cambodia. It still amazes me how you won’t see anything coming, and then the wall of the jungle will shake slightly, and you’ll realize a huge elephant is just a few meters away from you. Research at the SFS Center for Conservation and Development Studies focuses on the impacts of climate change on biodiversity and livelihoods in a rapidly developing country. Students and faculty work with government partners, community members, Indigenous groups, NGOs, and other key stakeholders. Our faculty and students seek to analyze and develop strategies to preserve the health of the Mekong River – one of the world’s most important water systems – and the wildlife and communities that depend on it. Climate change issues permeate all courses; however, in Cambodia we examine these issues specifically in relation to climate change ethics and governance and livelihood resilience. Climate change is examined in depth in the Mekong Delta. Students participate in interviews in Cambodia and upload the responses to the Climate Crowd database, have guest lectures from Can Tho University professors in Vietnam on climate change, undertake a field trip in the delta on climate change vulnerability, and participate in a group activity on climate change displacement. The issues of biodiversity conservation and loss of biodiversity are central to conservation practice in Cambodia and are closely linked to livelihood transitions. Our coursework examines the issues of deforestation and fragmentation, loss of breeding habitat, poaching and wildlife trafficking, and agricultural expansion. Students also explore conservation projects in Cambodia to understand solutions for and approaches to biodiversity conservation. Students meet with groups involved in conservation projects and have guest lectures on this topic. Community rights are examined in relation to conservation projects, as students consider community rights to participate in conservation and the ethics and governance of community-based approaches. Students study conservation issues that are closely linked to community rights such as land grabbing and land-use planning without community consultation. Students visit conservation projects with community involvement, visit community-based ecotourism projects, and meet community members who discuss communal land-rights issues. Students are tasked with drawing upon environmental justice principles, national and regional policies, and developing customary legal norms to examine a range of scenarios which pose ethical conundrums. These include indigenous peoples’ access to natural resources and land rights, development in protected areas, waste management, and transboundary environmental harm. Students participate in field exercises for each scenario, which are often undertaken in collaboration with local government officials, NGOs, and private stakeholders. Students explore both the high levels of dependence upon natural resources by local populations and the primary drivers of change in local livelihood strategies. The coursework explores approaches to finding a sustainable balance between human needs and biodiversity preservation. Students undertake a range of field trips to understand lowland and upland livelihood strategies of farmers and fishers. 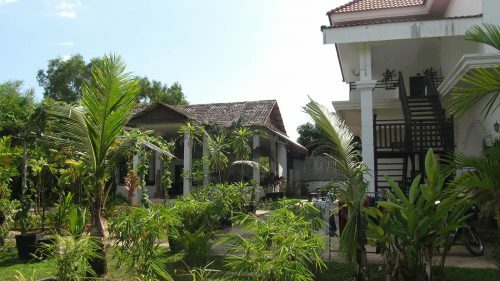 SFS is an active part of the Siem Reap community. Locally known as the Center for Environmental Research in Conservation and Development Studies, students collaborate with local students at the Paññāsāstra University of Cambodia (PUC), take a short homestay in a floating village, visit bustling markets, and attend festivals. SFS research data is shared with the community and used to establish local environmental policies.